Book only. Edited by Peter Devereux and John Camden. Recorder. Classical. Book only. With solo part, standard notation and piano accompaniment. 68 pages. G. Schirmer #ED2833. Published by G. Schirmer (HL.50331960). 9x12 inches. 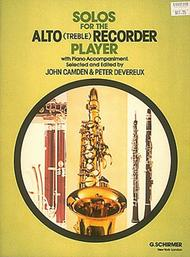 Edited by John Camden and Peter Devereux. Contents: Watkins Ale (Fitzwilliam Virginal Book) • Loth to Depart (Farnaby) • Sonata No. VI in G minor (Vivaldi) • Trio in D minor (Bach) • Sonata in F (Handel) • Sonata in G (D. Scarlatti) • Suite in A minor (Telemann) • Sonata No. 4 in C minor (Francesco) • Dances from Orfeo (Gluck) • German Dances (Haye) • Minuet from The Fair Maid of Perth (Bizet) • Suite from Album for the Young (Tchaikovsky).